The 🐐 putting in work at the Wasserman Football Center! If I'm Bryce Harper I'm a little worried about Sam Darnold stealing my perfectly-coiffed-hair corner. How to watch: ESPN, FOX, or NFL Network. Patriots Day 2 picks: 63. Making moves: New England acquired offensive lineman Trent Brown Friday in a trade with the 49ers. Essentials: Here's our pick tracker. 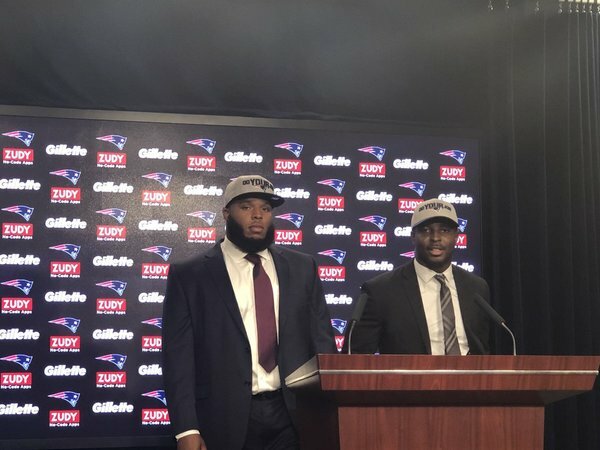 First round review: Meet Isaiah Wynn and Sony Michel, who were introduced at Gillette Stadium on Friday. | On Football: The Patriots’ first-round game plan was to play it safe. Misc. : Teams get 7 minutes per pick in Round 2, and 5 minutes per pick in Round 3. And Day 2 of the draft is officially underway with the Browns on the clock. Cleveland opens Round 2 by selecting Nevada OL Austin Corbett. Overview: A no-star recruit out of Sparks, Nev., Corbett lettered in four sports in high school, earning a First Team All-State nod in the shot put. With no FBS scholarship offers, Corbett opted to walk-on at nearby Nevada. After redshirting in 2013, he started 49 of a possible 50 games over the next four seasons at left tackle, including 48 consecutive, earning All-Mountain West honors the final three (including a first-team nod in 2017). Corbett served as a captain his final two years with the Wolfpack. Over those final two seasons, he was charged with only three sacks allowed — including none for the entire 2016 season — and committed only seven penalties. Analysis: Corbett is lauded for his professional attitude and mature leadership traits that are ready for an NFL locker room right away. He’s highly regarded as a technician in pass protection for the diversity of hand tactics he uses to attain leverage and keep defenders guessing, as well as the violent punch he wields to initiate contact and lock on to defenders. Corbett is an average overall athlete, with tight hips that hurt his recovery skills. He’s not a poor athlete by any stretch, but he’s not an explosive one, either, with minimal room for error in his steps. But his high IQ for the game should help mask those deficiencies, and his rugged toughness and finishing attitude should endear him to NFL coaches. Although he played exclusively on the edge during his time in Reno, Corbett will likely have to kick to the interior, either as a guard or center, to be a starting option early at the next level. And the Giants take an offensive lineman with the 34th overall pick: UTEP OL Will Hernandez. Overview: Originally recruited as a defensive tackle out of high school, Hernandez received scholarship offers from Pac-12 programs (USC, Arizona State), but was unable to qualify academically in time for signing day. However, one school stayed by his side: UTEP. And the Miners unearthed a sizeable gem in the 2013 recruiting class. After moving from the defensive line to the offensive line during his redshirt year in 2013, Hernandez went on to start every game at left guard the past four seasons (49 consecutive starts). Analysis: Sporting the throwback neck roll, Hernandez looks like an old-school blocker and competes with the smash-mouth style reminiscent of the past. With his thick, wide frame, he is able to comfortably carry 340 pounds without sacrificing his foot quickness. While he is coordinated in his shuffle, Hernandez’s calling card will always be his upper-body power — displayed in his 37-rep bench press session at the Scouting Combine — using heavy hands and a violent punch to win the point of attack. Hernandez will allow his aggressive nature to get the best of him, finding himself hunched at the waist. But he is a physical mauler who will block through the echo of the whistle and with a dash of patience, he has the skills to be a Pro Bowl guard in the NFL. UTEP hasn’t produced a first-round pick since 1968, but Hernandez has a very real opportunity to break that streak.
.@MikeMayock says this of Will Hernandez: "He just doesn't like people." And the Browns use their second pick in the second round on Georgia RB Nick Chubb. Overview: With Todd Gurley and Keith Marshall atop the Georgia running back depth chart in 2014, Chubb wasn’t expected to see the field as a true freshman. But Gurley and Marshall suffered season-ending injuries and Chubb beat out fellow freshman Sony Michel, emerging as one of the best backs in the country with 1,547 yards in his first season in Athens. His career track was altered by a gruesome knee injury in 2015 and Chubb never looked healthy in 2016. Chubb regained his bounce as a senior with a career-best 15 touchdowns, averaging 6.0 yards per carry for the 2017 SEC champions. Analysis: Built like a bruiser with a thick lower body, Chubb runs with outstanding balance and determination to stay on his feet through contact. Chubb marries his feet to his eyes to set up defenders with quick cuts, patching together his moves and forcing off-balanced tackle attempts. Chubb showed off his impressive lower-body power at the combine with 38.5-inch vertical and 10-feet-8 broad jump. With only four catches as a senior, Chubb is somewhat unproven as a receiving threat with Michel often handling the third-down duties for the Bulldogs. But as long as the doctors give the A-Okay with his surgically repaired knee, Chubb will be a solid day two running back target. The Colts use their first of two back-to-back picks on South Carolina State LB Darius Leonard, taken at No. 36. Overview: A no-star recruit who weighed 180 pounds out of high school, Leonard signed with South Carolina State after he received only a preferred walk-on offer from his favorite team, Clemson. He became one of the nation’s most productive players, starting all 43 games in his collegiate career while racking up 394 tackles (54 for loss), 22 sacks, eight forced fumbles, six interceptions and 13 passes defensed. He was named the MEAC’s defensive player of the year in 2016 and 2017. He accepted a Senior Bowl invitation and stood out in Mobile with his fluid movement, range and cover skills. Analysis: As his production suggests, Leonard was all over the field in college. With above average athleticism, length (34 3/8-inch arms) and hustle, he shows terrific range in pursuit and closes suddenly to ballcarriers. His movement also stands out in coverage, where he drops and transitions smoothly and can mirror against athletic backs and tight ends. He shined in his few games against FBS teams, totaling 19 tackles and blocking a kick against Clemson in 2016. Leonard needs significant refinement, however. While he shows good contact balance, play strength could be an issue, and he doesn’t have much room to add more weight. He also relies more on motor than smarts at this point — getting fooled by misdirection at times — and could stand to show more fieriness and aggression. The transition from FCS could take time, but Leonard showed well in Mobile. He profiles as a high-upside three-down linebacker at the next level. And with the second of back-to-back picks, Indy selects Auburn OL Braden Smith at No. 37. Overview: A four-star recruit coming out of Olathe (Kan.) South High School, Smith remains the program’s highest-caliber recruit in history. He was also a Kansas state champion in the shot put and discus. After pledging to Auburn over the likes of Alabama, Notre Dame, TCU, Ohio State and Texas A&M, Smith arrived on campus with weighty expectations and improved each year he was on campus. His first career start came as a true freshman at right tackle in the Tigers’ Outback Bowl loss to Wisconsin. He started all 40 possible games over the next three seasons, all but one of them coming at right guard. He paved the way in 2017 for running back Kerryon Johnson to lead the SEC in rushing (120 yards per game) as he earned First Team All-SEC and All-America honors. Analysis: While he can sometimes be feast-or-famine as a blocker, Smith is strong as a mule and plays angry, regularly moving the line of scrimmage even in one-on-one blocks. He stays busy until the whistle, actively looking for a body to get a hat on, and is no stranger to the weight room. Smith looks the part of an NFL-caliber offensive lineman, and checks off the necessary boxes for athleticism, strength and intelligence to keep ballcarriers clean. 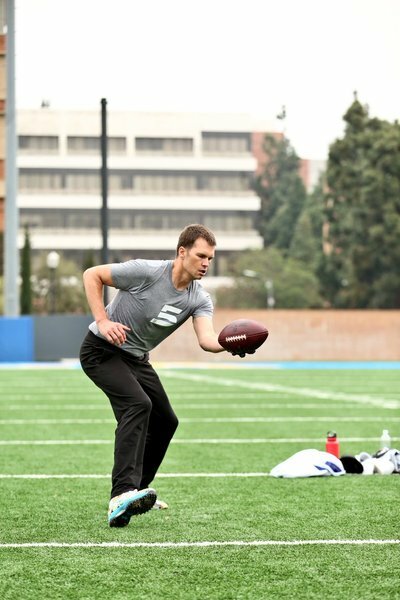 While his hands are active, he also needs to refine his hand tactics, but he still projects as an NFL starter with his balanced lower body and bullish upper-body strength. The Bucs, picking at No. 28, take USC RB Ronald Jones. Overview: Jones arrived at Southern Cal as a football and track star out of McKinney, Texas, and made an immediate impact as a freshman, rushing for a team-high 987 yards to break Charles White’s 39-year-old school freshman rushing record. Jones also earned honorable mention All-Pac-12 honors. He took over the starting job when Justin Davis was injured in the middle of the 2016 season and went on lead the team with 1,082 rushing yards while scoring 13 total touchdowns. He had four 100-yard efforts while starting the final six regular-season games and made second-team All-Pac-12. He also spent some time with the USC track team in 2016. Jones saved his best for what would prove to be farewell season with the Trojans, rushing for 1,550 yards and 19 touchdowns in 2017. He earned first-team all-conference honors and decided to forgo his senior year to enter the draft. Analysis: Jones, who dealt with a nagging hamstring injury throughout the pre-draft process, is an explosive athlete who accelerates to and through the hole. His track speed also enables him to get to the outside and challenge the pursuit angles of defenders. He often does so by moving from the inside to the outside without losing speed, and he can stop on a dime to make defenders miss. Jones runs with good instincts, setting up his moves downfield and is willing to meet defenders when necessary. While he can play physical and is a willing — if marginally effective — blocker in blitz pickup, Jones lacks the ideal frame for an every-down back in the NFL and durability could be a concern. He needs to improve his production between the tackles and show that he is more than a check-down option in the passing game, but Jones is a proven playmaker who has drawn wide comparisons to former Chiefs star Jamaal Charles. At No. 39, the Bears select Iowa center James Daniels. Overview: As a four-star recruit out of Warren, Ohio, Daniels was a three-year starter on both sides of the line for Warren G. Harding High School and opted to follow his brother LeShun to Iowa. Daniels made an impact quickly, appearing in all 13 games as a true freshman in 2015 with two starts at left guard. He moved to center for his final two seasons with the Hawkeyes, starting 23 of a possible 26 games, earning All-Big Ten honorable mention in 2017. He allowed six sacks and three quarterback hits over those final two seasons, before electing to enter the draft early. Daniels’ vertical leap and broad jump both ranked in the top 10 of offensive linemen at the NFL combine in Indianapolis. Analysis: Daniels was regarded as one of the best if not most productive interior blockers in college football the past two seasons, demonstrating the first-step explosiveness, body control, punch and mobility requisite for success centers at the NFL level. Working against Daniels is his medical history, having missed three games over the last two years with knee issues, though he is healthy know. Daniels is also just 20 years old, though he generally showed a maturity beyond his years on the field and has a sky-high football IQ. Throughout the evaluation process, Daniels hasn’t given many reasons to think he won’t be able to succeed at the NFL level, with his clean mechanics, athleticism and intelligence, though he will probably need to continue adding strength to his frame. With the 40th pick, the Broncos take SMU WR Courtland Sutton. Overview: Sutton was lightly recruited after playing in a run-first offense in high school. After Colorado pulled a scholarship offer, SMU offered a scholarship to Sutton to play safety. During his redshirt year in 2014, Sutton moved to offense and quickly emerged as one of the nation’s most impressive wideouts. In Chad Morris’ offense, he posted back-to-back 1,000-yard receiving seasons as a sophomore and junior, collecting 31 touchdown catches the last three seasons. Analysis: The built-in-a-lab wide receiver frame helps Sutton stand out. He has a tall, rangy frame, filled-out build and loose body control. He is an impressive athlete with powerful strides to eat up soft coverage and stack cornerbacks on vertical routes. Cornerbacks will crowd him on underneath throws, but he plays with confidence even with draped on his back, boxing out and attacking the catch point to make 50-50 balls look more like 80-20. Sutton’s inconsistent ability to separate puzzles some evaluators, especially with elite-level testing in the short-area agility drills — 6.57 three-cone drill. Sutton has the lower-body athleticism to uncover although his route running is a major work in progress. With NFL coaching and refined sink-and-snap, Sutton is one of the few receivers in this draft class with the potential to be a true No. 1 receiver in the NFL. The Raiders trade the 41st pick to the Titans. And the Titans draft BC DE Harold Landry at No. 41. Overview: Landry committed to BC (his first offer) as a junior out of Pine Forest in North Carolina, and late offers from larger programs like Ohio State and Clemson didn’t entice him away from Chestnut Hill. In 2016, Landry put himself on the first-round radar with a FBS-best 16.5 sacks and seven forced fumbles. He surprised many by electing to return to school due to unfinished business at Boston College and the desire to improve his draft standing to help his family. His senior season didn’t go quite as expected due to a nagging right ankle injury, but the tape shows one of the better pass rushers in this draft class. Analysis: A slippery athlete off the edge, Landry has an outstanding blend of flexibility and arc speed to burst off the snap and immediately threaten the corner, keeping blockers on their toes. While his athleticism is his calling card, he has also developed various pass rush moves to set up offensive tackles, using his 33-inch arms to swipe away the jabs or extend into blockers, putting them on skates. Pass rush is what makes Landry appealing as a pro prospect. He does have flaws in the run game with suspect game strength. He is late to shed blocks and make plays in the hole. His lackluster senior season will weigh on the minds of some evaluators, but as his combine performance showed, Landry is an explosive pass rusher in the same mold as Von Miller. The Titans get: pick 41. The Raiders get: picks 57 and 89. The Dolphins use the 42nd pick on Penn State TE Mike Gesicki, and the Patriots are on the clock with the 43rd pick. Overview: A younger prospect with four years of experience entering the league at age 21, Gesicki is a natural athlete and top competitor who starred in most every sport he tried in high school (basketball, volleyball, football). He also won the New Jersey Mr. Basketball award and state slam dunk contest as a senior, while garnering attention and scholarship offers out of high school in all three sports. Gesicki landed at Penn State as a top-five recruit from New Jersey - Notre Dame’s Quenton Nelson and Michigan’s Jabrill Peppers were ahead of Gesicki - and had 11 catches as a true freshman. He became a three-year starter (31 total games over his final three years) with 15 touchdown receptions and 118 receptions in that span. Analysis: Gesicki is still growing into his frame and the role of an inline tight end, but he’ll be drafted for his secondary-stressing skill set - acrobatic receiver skills with straight-line speed and vertical burst to separate. Gesicki can go up and get it in the red zone with springs in his legs to get up and over safeties and linebackers. He looks much lighter than 250 on the field and has questionable strength to set the edge in a run-first scheme. Gesicki struggles to sustain almost any block even when lined up wide. He likely needs development and route refinement, but is eager to work and contribute. Gesicki has excellent agility and H-back qualities to develop as a reliable receiver with potential to be good enough to contribute as a blocker. Patriots trading. No Jimmy Garoppolo memorial draft pick. The Patriots trade the 43rd overall pick to the Lions. 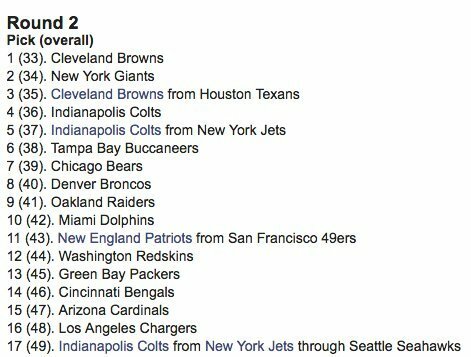 The Patriots get: picks 51 and 117. The Lions get: pick 43.